baskets and other things are plaited by traditional methods, just like wicker baskets. what makes Makkirequ‘s work unique? the material. it changes the waste into useful items, that can be real and unique decoration of our living space. 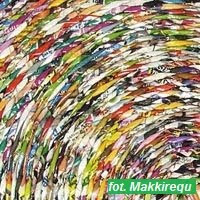 you can buy things made by Makkirequ, by ordering them directly from her – e-mail: jablko777@wp.pl. her handicraft you can find in online stores, like: decobazaar, pakamera or “fiu fiu” gallery.